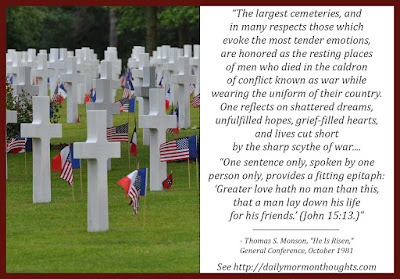 "The largest cemeteries, and in many respects those which evoke the most tender emotions, are honored as the resting places of men who died in the caldron of conflict known as war while wearing the uniform of their country. One reflects on shattered dreams, unfulfilled hopes, grief-filled hearts, and lives cut short by the sharp scythe of war. "Acres of neat, white crosses in the cities of France and Belgium accentuate the terrible toll of World War I. Verdun, France, is—in reality—a gigantic cemetery. Each spring, as farmers till the earth, they uncover a helmet here, a gun barrel there—grim reminders of the millions of men who literally soaked the soil with the blood of their lives. "One sentence only, spoken by one person only, provides a fitting epitaph: 'Greater love hath no man than this, that a man lay down his life for his friends.' (John 15:13.)" 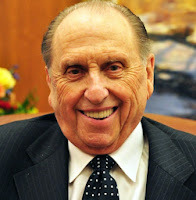 In his many discourses over the years, President Monson several times expressed a particular sensitivity for the victims of war. 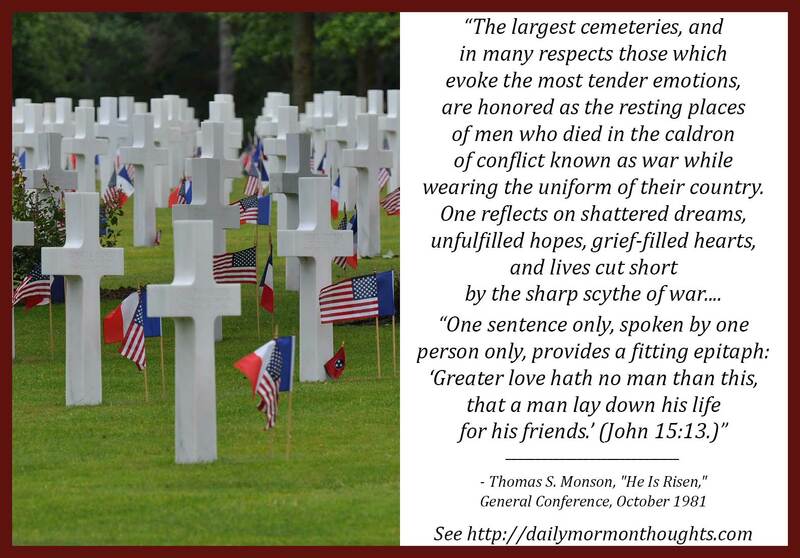 In this example, he reflected on the visual impact of a military cemetery and all it represents of the lives of those whose mortal remains rest there. How tender and fitting to contemplate "shattered dreams, unfulfilled hopes, grief-filled hearts, and lives cut short by the sharp scythe of war." President Monson identified the greatest tribute that would be offered to those who so unselfishly gave their lives in defense of country and freedom: "Greater love hath no man than this, that a man lay down his life for his friends." And he goes on in the talk to replace the darkness of despair with the hope of eternal life offered by the death and resurrection of the Savior. How blessed we are to have that eternal hope!